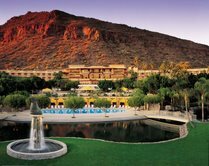 In a growing trend amongst luxury hotel groups, Starwood is adding a private residence club to the Phoenician® resort - a AAA Five Diamond property located at the base of Camelback Mountain in Scottsdale, Arizona. The club is converting 5 casitas and building 7 new casitas, with these two- and three-bedroom fractional residences, ranging from 1,400 to 2,400 square feet. The Phoenician® grounds (pictured right) comprise over 250 acres and club members can use the resorts own 27- hole championship golf course. Unwind in one of nine shimmering pools. Invigorate themselves with a match at the tennis garden. Or simply savor a moment of peaceful reflection at the spa, The Centre for Well-Being. Members in the Phoenician Residences will purchase a three week Club Interest with two fixed weeks during peak seasons and one floating week during the summer. The pricing is from under $200,000 to more than $300,000 depending on the specific floor plan, location, views and the weeks selected. All members also automatically become Platinum Level Starwood Preferred Guest (SPGSM) members and will have a variety of Platinum benefits such as upgrades and complimentary access. Starwoods other private residence clubs are the St. Regis Club New York and the St. Regis Residence Club Aspen.